Just a few weeks back Overclock3D took a look at the latest mid-range card in ATI's new 4800 line-up. While maybe not the fastest dog on the track, the 4850 offered an unmatched performance to price ratio and even managed to give its dual-GPU'd predecessor; the 3870x2 a run for its money. At the time we couldn't get our grubby mits on ATI's top-end card the 4870 so our comparison seemed slightly weighted in the favour of NVIDIA's GTX200 series. However, PowerColour - one of ATI's largest AIB partners has been kind enough to send over one of their stock-clocked 512MB 4870's and today we're going to be putting it head-to-head with everything the green team has to offer in both the performance and price stakes. 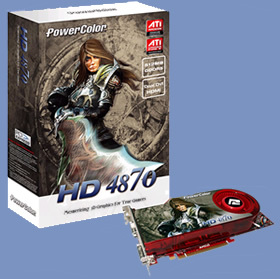 PowerColor is the platform of choice for avid PC gamers and video prosumers looking to get the best possible performance out of the latest graphics processors from ATI. PowerColor graphics cards deliver every-last-drop of super-charged performance from ATI's most advanced visual processing units (VPU). Running a PowerColor graphics card, today's gamers are able to unleash the 3D graphics performance of their favorite game playing it the way it was meant to be played. PowerColor graphics cards won at least 10 awards every month in 2004 from the world's most respected IT media and organizations. Furthermore, several PowerColor products also received 2005 Taiwan Symbol of Excellence Award from the Ministry of Economic Affairs of the R.O.C. according to the following criteria: Design and Innovation, Quality System, Market, and Brand Awareness. This award represents some of the most revolutionary, high tech, high quality, and high value products in the market. The right products, the right time, and the best quality is the basic of our product strategy. To put our products one step ahead of the rest, we analyze the trends of the industry, and study the requirement of the market. Meeting the market's requirement is the core of our branding strategy and our customers' opinions are always the most important part of this process. On paper the 4870 may look like nothing more than a core and memory overclocked version of the 4850 with an upgrade to GDDR5. However, the transfer from GDDR3 to GDDR5 has given the 4870 a significant boost in memory bandwidth from 1.9Gbps to 3.0Gbps with an actual reduction in memory clock speed! For obvious reasons the GDDR5 architecture should also scale much higher than GDDR3, potentially giving us a lot more headroom when overclocking. So with all this extra performance, will the 4870 be able to perform even better on our CPF (Cost Per Frame) scale, or will the higher price of GDDR5 and inflated top-end-product figures be the cards downfall. All will be revealed over the next few pages.